A few weeks ago, I lead a workshop at the mka institute in Germantown that focused on healing plant-based foods, particularly ancient foods that many of us have lost connection to. I also talked extensively about re-examining and refining our connection to nature by way of honoring it and ourselves. To some degree, we have come to shun foods that our ancestors relied on for longevity and healing and replaced it with a “modern” diet that is more accommodating to the fast paced lifestyle many of us are akin to. While the list of ancient of foods is a bit extensive to capture in this blog, there is one particular ancient food that is easy to prepare, high in nutritional value and delicious, beyond measure. First, a little history about this amazing fruit: Plantains originated in Africa and since its inception (which no source can truly date), has travelled the world. From Africa to Asia, to the Middle East, from South America to North America, plantains has made its mark, finally evolving into the staple banana, and claimed fame as the world’s best selling fruit. 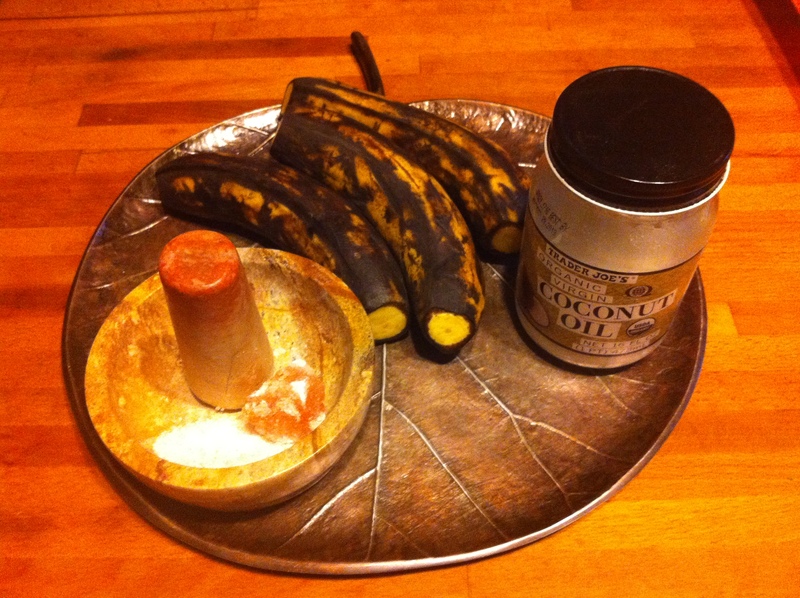 Yes, the banana that many of us are so fond of is a hybrid or mutation of the plantain. My love for plantains/bananas spans back many moons, from my college years with my Dominican roomies who taught me how to pick, slice, mash and fry. From my trip to the Caribbean where plantains were served with every meal and especially from my grandfather (who lived well into his late 90’s) who ate bananas daily now mirrored in my son’s love for his daily banana. So what’s the difference really? Plantains are not as sweet as the yellow banana and are more starchy in taste and composition. 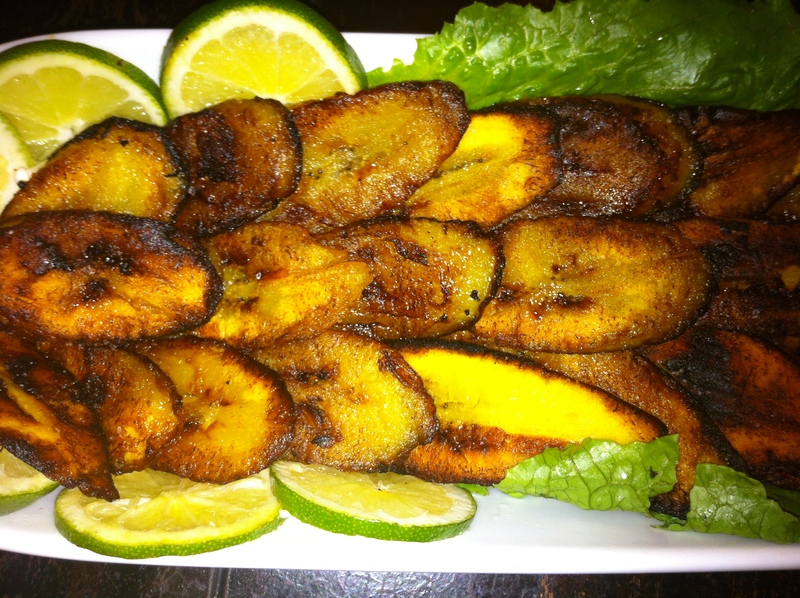 Plantains are also usually eaten cooked and not in it’s raw form. With all the hype over bananas, many of us already know that they are loaded with potassium. The potassium in bananas is helpful in combating hypertension due to its water balancing effect. Potassium is a major electrolyte inside the cells and counteracts the effects of sodium. Not only are plantains/bananas rich in potassium, they also contain copious amounts of other vitamins such as A, B6, B12 and C and are a great source of fiber. The best kept secret about plantains/bananas is that they contain a key amino acid, tryptophan, known as nature’s sleeping pill. Tryptophan is a body protein, a building block for the conversion of serotonin, a mood enhancer that regulates emotions, behavior, pain and sleep patterns. Tryptophan may also play a role in the prevention of anxiety, depression and other disorders. Not that any one particular food can meet all of the body’s needs, but the value of this ancient food is unsurpassable. As an addition to a balanced diet, plantains can do wonders for the mind, body and spirit. Preparing plantains can be quite simple. Green plantains are a great addition to soups and stews, as they are delicious steamed. The more ripe the fruit, the sweeter it is. This is the ideal state for lightly frying, baking or grilling. My preference is ripe, sweet and lightly fried in coconut oil with sprinkles of pink sea salt, as seen here. Enjoy!